This book details implementing and managing an SAP Portal for integrating websites, applications, legacy systems, databases and document directories into one accessible interface. This chapter is excerpted from the book titled, 'SAP NetWeaver Portal Technology: The Complete Reference', authored by Rabi Jay, McGraw-Hill, ISBN 007154853X, Copyright 2008 McGraw-Hill. A portal platform is basically a portal runtime that is composed of Java libraries. The two primary functions of the portal platform framework are to provide the necessary runtime environment so as to run iViews and to administer iViews. up of a Java API known as the portal runtime API, which is a collection of portal components and services. The portal components and services provide the basic core functionality to help the portal run efficiently. Portal components and services can be either provided by SAP or custom-built. Figure 2-2 displays the list of portal applications, components, and services deployed on the portal. This iView is available only if you have the Java Developer role. Visit the McGraw Hill website for a detailed description and to learn how to purchase this title. are Java Server Pages (JSPs) or Java classes that produce HTML output, which is displayed on the client browser when a page is rendered. 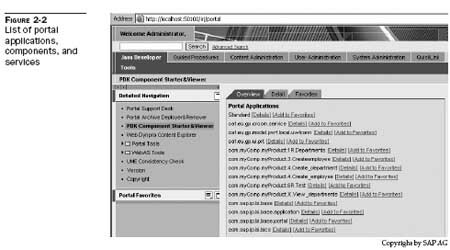 These core portal components include the page builder and administration tools. The portal components are responsible for creating the necessary content for display in the iViews.